"Printed in Germany 1972" and "Ullstein Buch Nr. 2877" is stated on the copyright page. The copyright for the translations is assigned for the year 1972 to the publisher. Month of publication from Science Fiction Times #128. The continuous series numeration is derived from counting the editions: it is not stated. 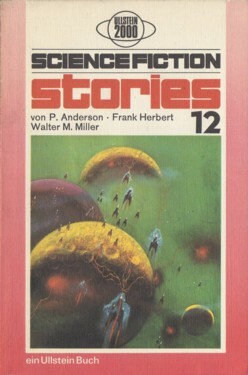 It's 'Science Fiction Stories' on the cover and the spine, but 'Science-Fiction-Stories' on the title page (we acknowledge titles by denomination on the title page). The table of contents appears on p. 5. The last page of the final item is not numbered. The cover art is credited on the copyright page to 'Pyramid', which is a publisher, not an artist.